← NEWS: July Event theme change announced! Well, back from our summer holidays at Death Beach, it’s time to send you a little postcard to share news on the next events coming up in August. REVENGE OF THE REJECTED TOYS! 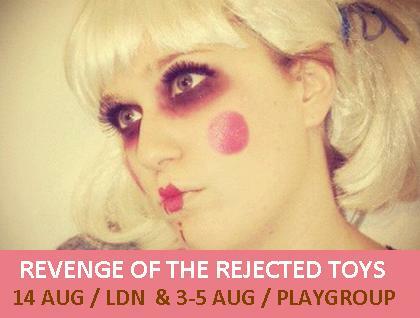 We’ll be previewing the theme at special festival workshops and salons at the amazing Playgroups Festival, Tunbridge Wells 3-5 August, then back in London at our lovely base of Cass Art on Tues 14 August for the final salon of the summer…Don’t miss out…or Dollface Dolores might creep out from under your bed and get you!